Cameron Diaz treats herself to a massage! The 46-year-old The Other Woman actress looked relax after her pampering session on Thursday (March 7) in West Hollywood, Calif.
That same day, Cameron stopped by Whole Foods in Beverly Hills to pick up some groceries. Drew Barrymore Celebrates Her Birthday with Gwyneth Paltrow, Cameron Diaz, & More! Drew Barrymore celebrated her 44th birthday on Friday (February 22) and she was surrounded by some of her best friends! Gwyneth Paltrow shared a photo of her, Drew, Cameron Diaz, Nicole Richie, Lake Bell, hair stylist Lona Vigi, and food blogger @Oilandsalt sitting together on a staircase. Cameron Diaz is looking stylish and chic. The 46-year-old There’s Something About Mary retired actress stepped out with friends on Saturday (February 16) in New York City. PHOTOS: Check out the latest pics of Cameron DiazCameron looked chic in a green coat, slim fit jeans and black boots on her daytime outing. Benji Madden recently took to Instagram on Valentine’s Day (February 14) to pay tribute to his wife with a sweet post. 'My Best Friend's Wedding' Cast Reunites 22 Years After Film's Release! The cast of the 1997 hit romantic comedy My Best Friend’s Wedding – Julia Roberts, Cameron Diaz, Rupert Everett, and Dermot Mulroney – reunite on the cover of Entertainment Weekly‘s new issue! Cameron Diaz makes her way through the parking deck after picking up some groceries on Wednesday (January 23) at Eataly in Beverly Hills, Calif. The 46-year-old The Other Woman star looked cool in a yellow scarf, yellow zebra-striped sweater, and jeans as she stepped out to run a few errands. The week before, Cameron was spotted meeting up a couple of friends as they grabbed a sushi lunch at Matsuhisa. Cameron Diaz is making the best of a rainy day! The 46-year-old There’s Something About Mary star was spotted enjoying lunch with friends at Matsuhisa on Tuesday (January 15) in BeverlyHills, Calif.
Cameron kept it simple and chic in a black knit sweater, jeans and matching dark boots on the lunch outing with her friends. Green Book director Peter Farrelly has issued a statement after an article published this week pointed out numerous press clippings of stories about him flashing actress Cameron Diaz back in the 90s. Cameron Diaz has her hands filled with grocery bags as makes her way back to her car on Friday night (December 21) in Century City, Calif. The 46-year-old former actress looked pretty going makeup-free in a printed sweater, jeans, and booties as she stopped by Eataly to pick up some pastries and cheese ahead of the holidays. Cameron Diaz is All Smiles Stepping Out for Lunch! Cameron Diaz flashes a smile as she makes her way into the The Montage Hotel on Friday afternoon (November 30) in Los Angeles. The 46-year-old former actress looked super chic in a black-and-white printed duster, yellow scarf, and jeans as she met up with a friend for lunch. Just last weekend, Cameron and husband Benji Madden stopped by Nick Swisher‘s birthday party at a bowling alley. Jenna Dewan & Boyfriend Steve Kazee Hold Hands on Date Night in Studio City! Jenna Dewan and boyfriend Steve Kazee hold hands as they leave Nick Swisher‘s birthday party at Pinz bowling alley on Sunday night (November 25) in Studio City, Calif. The 37-year-old actress/dancer looked cool in a leopard-print jacket and black jeans while the 43-year-old actor rocked a leather jacket over a red and black flannel shirt as they were joined at the party by Cameron Diazron Diaz and husband Benji Madden. Co-star Dermot Mulroney is already down. Gwyneth Paltrow & Brad Falchuk's Wedding Photos - See the Celeb Guest Pictures! It was a star-studded wedding for Gwyneth Paltrow and Brad Falchuk this weekend! If you don’t know, the Hollywood couple got married on Saturday (September 29) at Jerry Seinfeld‘s massive East Hamptons estate in the posh New York area. Cameron Diaz and her husband Benji Madden were photographed leaving the venue, as well as Robert Downey Jr. with his wife Susan and Rob Lowe.In addition, there are photos of the guests arriving for the ceremony in the gallery below! The Oscar-winning actress was previously married to Coldplay’s Chris Martin before “consciously uncoupling” in 2014. Benji Madden is sending his love to wife Cameron Diaz on her birthday! The 39-year-old Good Charlotte band mate took to Instagram on Thursday night (August 30) to wish his wife on her 46th birthday. Cameron Diaz wheels her grocery cart out of Whole Foods and heads to her car on Saturday (August 25) in Glendale, Calif. The 45-year-old actress stocked up for the weekend at the market! Recently, Kristen Stewart spoke about the Charlie’s Angels reboot, which will star Kristen, Naomi Scott and Ella Balinska. The 2000 movie starred Drew Barrymore, Cameron and Lucy Liu. Drew Barrymore & Cameron Diaz Have 'Charlie's Angels' Reunion at the Grocery Store! 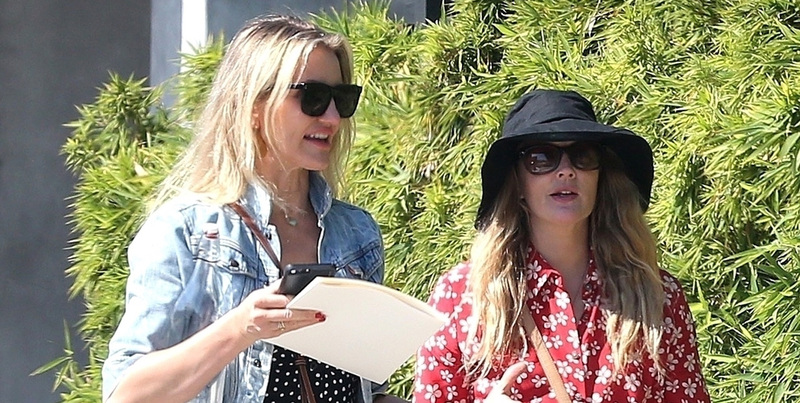 Drew Barrymore and Cameron Diaz reunite for a grocery shopping trip! The Charlie’s Angels co-stars were spotted visiting Bristol Farms on Saturday (August 4) in Hollywood. Drew kept it casual in a blue, pink, and purple plaid button-up shirt with dark sweatpants, brown sandals, a round hat, and purple sunglasses, carrying a drink in her arm. Drew Barrymore & 'Charlie's Angels' Co-Star Cameron Diaz Reunite for Makeup-Free Selfie! It’s a Charlie’s Angels reunion! Drew Barrymore, 43, and Cameron Diaz, 45, posed for an Instagram selfie together on Friday (July 13). “#nomakeup #nofilter #oldschoolsisters #playdate #dayoff #friday #SUNSCREENALWAYS,” Drew captioned the photo, taken inside their car. Check out the Santa Clarita Diet star and the The Other Woman actress putting their fresh faces on display below! Cameron Diaz & Benji Madden Continue Their Romantic Italian Vacation! Cameron Diaz and Benji Madden are continuing their romantic trip to Italy! The 45-year-old retired actress and 39-year-old musician were spotted on an afternoon stroll on Friday (June 29) in Florence, Italy. Cameron Diaz wraps her arm around husband Benji Madden while snapping a photo in a beautiful garden on the grounds of the Four Seasons Hotel on Thursday (June 28) in Florence, Italy. The pic was snapped by the couple’s longtime friend, movie producer David Katzenberg, who joined them on the vacation. An on-looker told E! News that Cameron and Benji looked “very much in love” on the trip. Cameron Diaz is in a great mood while on a grocery run! The 45-year-old retired actress was spotted making a solo run to Whole Foods on Saturday (June 16) in Beverly Hills, Calif.
Cameron was all smiles while making her way out of the store, looking casual and waving as she headed home for the day. It was recently announced that the house Cameron‘s character lived in for 2006 movie The Holiday is up for sale. Cameron Diaz makes her way back to her car after doing some shopping by herself on Tuesday afternoon (May 22) in West Hollywood, Calif. The 45-year-old retired actress kept things super chic and casual in a white sweater, jeans, animal-print flats, and sunglasses as she enjoyed her afternoon outing. It was recently announced that the house Cameron‘s character lived in for 2006 movie The Holiday is up for sale! "I took a lot of sh** for it," the Aerosmith rocker confessed to James Corden. Cameron Diaz & Husband Benji Madden Head Out for the Day With Cameron's Mom! Cameron Diaz and Benji Madden are brightening up Cameron‘s mom’s day! The married couple were spotted bringing flowers to Cameron‘s mother on Sunday (April 15) in Seal Beach, Calif.
After meeting up with Cameron‘s mom, the trio then went out to lunch together in town.One day before, the duo were spotted at Gwyneth Paltrow‘s black tie event on Saturday (April 14) in Los Angeles. Kate Hudson & Cameron Diaz Bring Their Partners to Gwyneth Paltrow's Party! Kate Hudson and her boyfriend Danny Fujikawa arrive in style for Gwyneth Paltrow black tie event on Saturday (April 14) in Los Angeles. Rumors have been swirling that the event last night was actually Gwyneth and her fiance Brad Falchuk‘s wedding! Cameron Diaz flashes a smirk as she makes her way back to her car after getting her nails done on Friday afternoon (April 13) in Beverly Hills, Calif. The 45-year-old actress kept things chic in a black top and Aztec printed maxi-skirt as she enjoyed an afternoon of pampering with a friend at a salon. Last month, Cameron announced in an interview that she’s retired and no longer making movies. A former costar previously said Diaz had called it quits, but then said she was joking. Remember how Selma Blair said that her friend Cameron Diaz has retired from acting, but then said she was just joking? Well, it seems she might not have been joking after all. Cameron, Selma, and Christina Applegate recently did an interview with EW together to reminisce about their 2002 comedy movie The Sweetest Thing. Cameron Diaz chats on the phone as she and husband Benji Madden head to a St. Patrick’s Day on Saturday afternoon (March 17) in Los Angeles. The 45-year-old actress kept things casual in a black turtleneck, black jeans, and a red bag while the 39-year-old rocker sported a black hoodie and sunglasses for the party. Is Cameron Diaz Retiring from Acting? Selma Blair Clarifies Her Quote! Selma Blair was quoted as saying that her pal Cameron Diaz has retired from acting, and now, she’s clarifying things a bit. Jennifer Lawrence, Cameron Diaz, & Adele Join Forces at Women's March 2018! Three fierce ladies joined forces at the 2018 Women’s March in Los Angeles – Jennifer Lawrence, Cameron Diaz, and Adele! The three award-winning entertainers stepped out with handmade signs at the march on Saturday morning (January 19) in Los Angeles. “I stand in solidarity for women’s rights, equal pay, DACA, and CHIP,” Jennifer wrote on her Facebook page. Cameron Diaz enjoyed an afternoon with a one of her gal pals! The 45-year-old actress and her friend were spotted stepping out for lunch at Waldorf Astoria Hotel on Thursday (January 18) in Beverly Hills, Calif. They looked like they were having a great time! Cameron looked chic in a brown long-sleeve shirt underneath a beige blazer, along with jeans and beige oxfords. She accessorized with hoop earrings and a brown purse. Cameron Diaz & Benji Madden See 'Hamilton' on Christmas Eve! Cameron Diaz wraps her scarf around her neck while walking up to the Pantages Theatre for a performance of Hamilton on Sunday (December 24) in Hollywood. The 45-year-old actress was joined by her husband Benji Madden while ringing in Christmas Eve with the hit musical. Cameron and Benji will be celebrating their third wedding anniversary on January 5. They tied the knot in secret at her home in Beverly Hills just seven months after they began dating. Cameron Diaz and her husband Benji Madden are taking care of their holiday shopping lists! The 45-year-old The Other Woman actress and the 38-year-old Good Charlotte guitarist were both seen stepping out to browse items this week.Cameron was spotted checking out jewelry at XIV Karats, Ltd on Thursday (December 21) in Beverly Hills. Benji grabbed an ice coffee while doing his shopping on Friday in West Hollywood. Cameron Diaz has her hands full as she heads to her car on Saturday afternoon (October 28) in Los Angeles. The 45-year-old Annie actress looked pretty in a navy dress covered in white flowers and flip flops as she headed home after spending the afternoon with a few friends. In case you missed it, Cameron recently lost her wallet as she was leaving dinner and a homeless woman was able to get it back to the actress! Cameron Diaz has a good Samaritan to thank this weekend after a homeless woman was persistent in making sure the actress got her missing wallet back! The 45-year-old actress was out to dinner at Matsuhisa restaurant in Beverly Hills on Thursday night (October 19) when she dropped her wallet on the street while getting in her car. A homeless woman saw the moment happen and brought the wallet back into the restaurant, but she was reportedly turned away, according to TMZ. Benji Madden Sends Love to Wife Cameron Diaz on Her Birthday in Rare Post! Benji Madden is sending his love to birthday girl Cameron Diaz! The 38-year-old rocker took to Instagram to share a super sweet – and rare – photo and post to his wife on her 45th birthday. Gwyneth Paltrow is sending all of her love to Cameron Diaz today! The 44-year-old Iron Man actress took to Instagram on Wednesday (August 30) to wish her BFF a happy 45th birthday. Cameron Diaz laughs with a few friends as she steps out on Saturday afternoon (August 26) in Seal Beach, Calif. The 44-year-old actress looked pretty in gray top, white skirt, and flip flops as she was joined by her mom Billie as they headed to an afternoon party hosted by one of their friends. For the past couple of years, Cameron has been spending some time out of the spotlight. 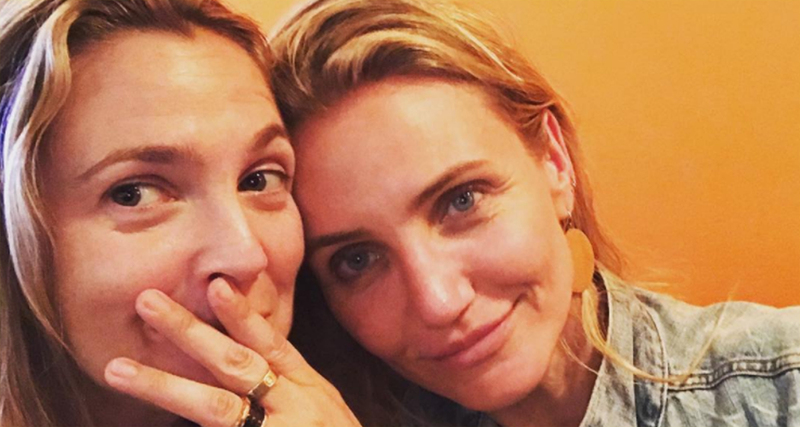 Cameron Diaz and Drew Barrymore reunited for a girls’ afternoon! The Charlie’s Angels co-stars were spotted taking a stroll on Saturday (July 15) on Melrose Place in West Hollywood, Calif.
Drewappeared to be helping Cameronshop for some new furniture pieces at a few different boutiques. Cameron wore a black and white polka-dot summer dress, short denim jacket, beige sandals, and circular earrings.Drewsported a flower-printed red blouse, dark pants, red sandals, and a black hat. Drew Barrymore Reunites With 'Charlie's Angels' Co-Star Cameron Diaz! Drew Barrymore and Cameron Diaz had a mini Charlie’s Angels reunion!The 42-year-old actress met up with her former co-star and real life BFF for a girl’s day together.Drew took to her Instagram to share a fun selfie from their time together.“Getting out of your house with your girlfriend. And being a whole person, with your sister. Remember to spend a moment with the ones you love in your busy life,” she wrote. Cameron Diaz is gushing about her husband Benji Madden! The 44-year-old actress opened up about waiting to get married until she was in her 40s and how Benji is her perfect fit.“I think it’s a matter of I just hadn’t met my husband, you know? I had boyfriends before. And there’s a really, really distinct difference between husbands and boyfriends. And I have a husband who is just my partner in life and in everything,” Cameron explained to ET. Gwyneth Paltrow Gets Support From A-List Pals at In Goop Health Event! Gwyneth Paltrow enlists support of her very famous pals for her first annual In Goop Health wellness summit on Saturday (June 10) at 3Labs in Culver City, Calif.
Cameron Diaz and Benji Madden stepped out for an adorable lunch date. The 44-year-old actress and the 38-year-old Good Charlotte lead guitarist were all smiles as they wrapped their arms around each other on Monday (June 5) in Beverly Hills, Calif. The married couple had just finished up lunch at Bouchon and were headed to do some shopping at AllSaints. Cameronrocked a black and white striped top, jeans, and trendy sandals, while Ben opted for a plaid shirt, baseball cap, and sneakers. Cameron Diaz has her hands full as she leaves a Whole Foods store on Wednesday afternoon (May 17) in Beverly Hills, Calif. The 44-year-old actress went comfy and stylish in oversized sunglasses, turtleneck sweater, and jeans for her rare outing. Cameron has been keeping a low profile over the past few months as she enjoys married life with husband Joel Madden. Cameron Diaz and Benji Madden stepped out together in honor of good friend Jessica Alba‘s 36th birthday! The 44-year-old actress and the 38-year-old Good Charlotte lead guitarist matched in all-black outfits as they headed into Delilah for dinner on Friday night (April 28) in Los Angeles. Who knew Britney Spears was such a big fan of Cameron Diaz?! The 35-year-old entertainer recently just re-posted an old Instagram photo of Cameron‘s from over nine months ago! Cameron Diaz is all about sharing her wisdom. The 44-year-old actress and author once dished out advice about the business to YouTube star Zoella (real name Zoe Sugg). Cameron Diaz rocks red lipstick as she makes her way out of the Montage Beverly Hills Hotel on Wednesday afternoon (February 15) in Beverly Hills, Calif. The 44-year-old actress spent the afternoon grabbing lunch with a friend before continuing her day around town. The night before, Cameron was spotted leaving a romantic Valentine’s Day dinner with husband Benji Madden at Giorgio Baldi restaurant.